I am mourning the loss of my beloved father, Konstantinos Nikas, who passed away in my arms on 15 December 2018 after a titanic battle with cancer at the age of 79. He was my mentor, my colleague and my best friend. He was the reason I became an engineer. Above all, he was a unique human being of exceptional abilities who helped countless people solve technical problems from the seemingly simplest to the truly most complex. Technical Manager and later General Manager of SKF Hellas in Greece (1967-2000), he was widely recognized the world over as the top bearing expert in Greece and educated more than 100,000 engineers and technical staff during his career, having given an estimated 700 lectures at SKF Hellas, in technical universities and in the industry. Some of his students now hold major managerial posts in Greece and abroad. His loss is a major blow to anyone that knew him. Words cannot pay respect to his rich personality. My beloved father, may you rest in peace in the arms of our Lord, Jesus Christ. Amen. Introduction: Dr George K. Nikas is a professional Mechanical Engineer licensed since 1995. He graduated from the National Technical University of Athens, Greece, in 1994, and received a Ph.D. and D.I.C. degree in Tribology and Contact Mechanics from the Mechanical Engineering Department of Imperial College London in 1999. He worked for nearly 10 years as Research Assistant and Research Associate in the Mechanical Engineering Department of Imperial College London. He has served as Associate Editor of the Journal of Tribology (American Society of Mechanical Engineers) and Member of the Editorial Board of 5 other engineering journals. Running tasks: scientific research and technical publishing in Tribology and Contact Mechanics. 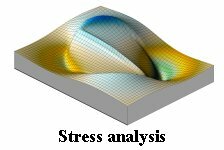 Research areas: mathematical analysis and computational modelling of tribological problems; effects of lubricant contamination particles; elastohydrodynamics and mechanics of hydraulic seals, toroidal Infinitely Variable Transmissions, spur gears and rolling bearings; hydrodynamics of thrust and journal bearings, including gas bearings; mechanical and thermal stress analysis; contact mechanics involving linear and nonlinear (rubber) elasticity, thermoelasticity, poroelasticity; fatigue life calculations; Finite Element Analysis; surface coatings.